Ignore what your mother told you and let your kids have fun playing with their food. 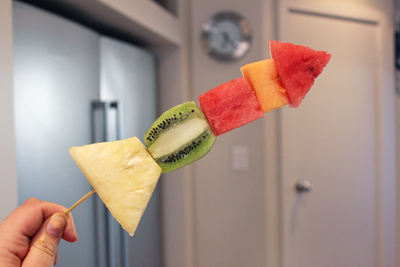 These fruit rocket ships are easy to make with just a little bit of help from mum and dad. If your littlies think fruit is boring, and would rather munch on sweets, this is a great way to get them interested in healthy food. Before you get started you can get your kids to design their rocket ships. You'll be doing most of the cutting, so this is a great way to get them involved. They'll need to have a point at one end, and a base at the other end. Get them to use coloured pencils that match the fruits you have available. 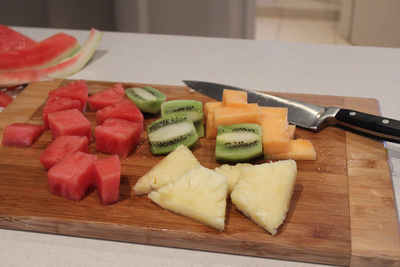 Start by cutting and peeling the fruit. You'll need one piece of fruit in a triangular shape for the tip, and another in a tetragon with the bottom wider than the top. 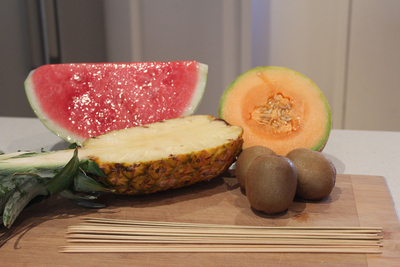 The other bits of fruit can be rectangular or square. Try not to make your fruit too thick or too thin. 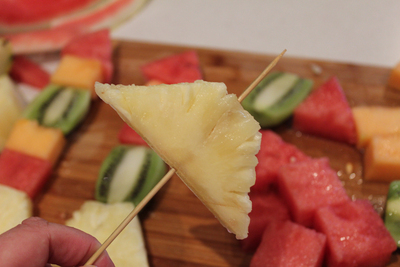 You don't want it too heavy for the skewer, but you don't want it to break off either. 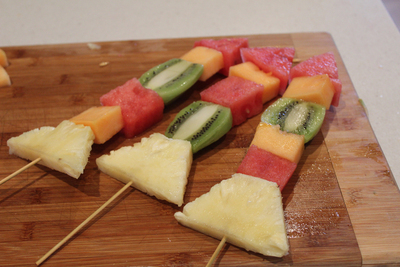 Starting with the base, push the skewer through the different bits of fruit. Kids will be able to do this part, but an adult will be needed for any harder fruits like pineapple so that you don't have any accidents. Finish up with the tip, and then the rocket ship is ready for flying and eating. 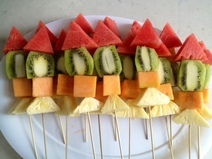 Some younger kids may not be able to join in, but it's still a fun way to present their fruit.